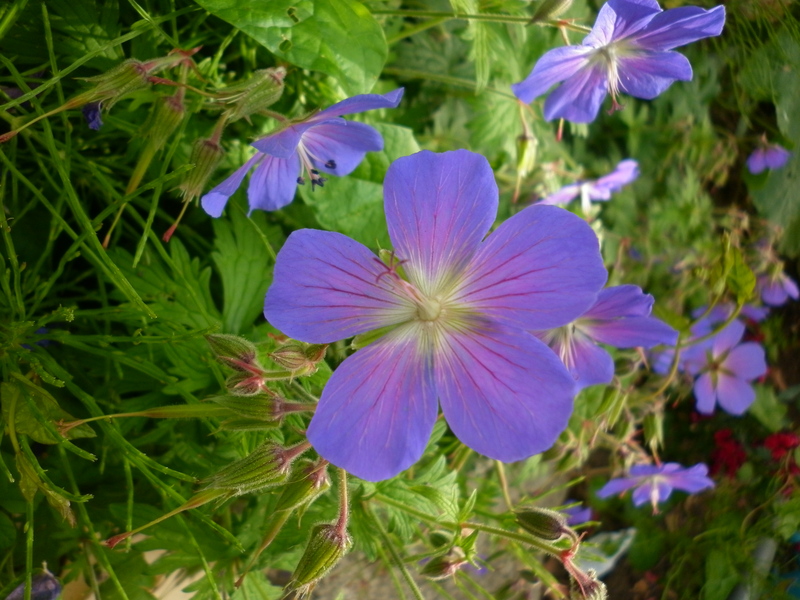 The beautiful geranium I’m considering moving. It would be great to get more plants as well. Is it okay to do that to perennials when they’re flowering? I joined Ravelry today. My friend popped around for a cup of tea yesterday and revealed that the crochet I was quite chuffed about wasn’t what I thought. (Very kindly, she has a gift for coaching) I’ve been practising basic stitches from a book and was quite chuffed but sadly they weren’t actually doubles, half treble and trebles because I’d only been putting the hook through one loop of the chain. I wondered why it had looked nothing like the picture. It still looked pretty though with a line between each layer, was easily rectified and now I know double the amount of stitches. Ta da. So – whoo hoo – I did it and whoosh, lost an afternoon. I didn’t notice that Ida had got into my seed tin and had joyfully strewn anything open around the garden. So much for my successional salad planting. It was worth it though – I have itchy fingers to make something… just can’t quite decide what… Gah. She has the most lovely lollopy soppy dog, Orlagh, who Ida is very fond of in principle but when she surged into the front room to give us all a kiss and sit on our laps Ida retreated to the back of the sofa like an alarmed parrot. “Go way dog, I like dog, go way dog..” Nik points out the size difference – we’d probably feel a bit wary of a pony gambolling around in our space and trying to sit on us. Best BT today is the amazing roast dinner (a gazillion Yorkshire’s) with Mum and Dad, we are all foot hoppingly excited about the circus on Saturday. Mum has brought a load of socks for Ida which are sorely needed and Dad arrives with a bag of food stuffs. Also sadly needed. I tell Mum how much we appreciate it and she recalls the food parcels her mum, my granny used to arrive with for us as kids. We talk a bit about memories and she says how connected it makes her feel to her mum to do the things for me that she appreciated from her (granny) Phew – did you follow that? sorry! It’s probably why the stuff she brings is always so spot on. As I write now I’m reflecting about how it’s important to receive gifts gracefully and with your heart open. That sometimes that’s as important as giving. Because they are a manifestation of love – and always saying, “no, no, no, you mustn’t..” is like turning the love aside. Also, after they’ve gone, I find my Mum has hidden ten pounds in the fridge. 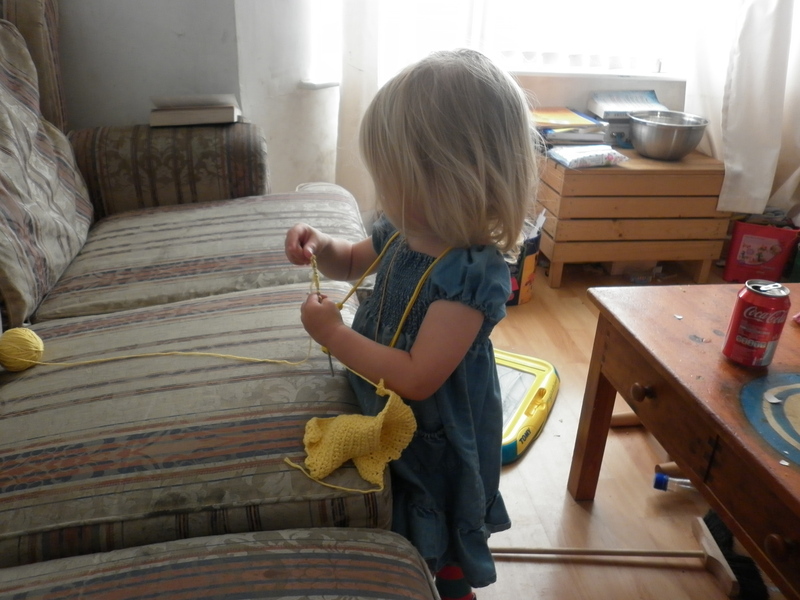 I end with a picture of Ida ‘helping’ with the crochet. This entry was posted in Uncategorized and tagged Beautiful Things, children, circus, craft, crochet, family, flowers, friends. Bookmark the permalink. I think the yellow crochet is very lovely, all your stitches are the same hight with a constant tension. Everyone gets turning chains wrong in the beginning and also lots of designers have different rules for how many and if they include them as a stitch. I need to find you on ravelry…what is your name? mine is osirismother.